As a consequence of Typhoon Yolanda (international name: Haiyan) hitting Tacloban City and the ensuing tsunami-like storm surge, a number of ocean-going ships were beached. These hulking ships are fast becoming a tourist destinations by themselves. During my visit to Tacloban, 8 months after Yolanda, I made it a point to visit some of these huge boats. A total of 10 commercial ships were were swept inland during the onslaught of Typhoon Yolanda. Eight were stuck in Rawis and Anibong Districts, one in Brgy. 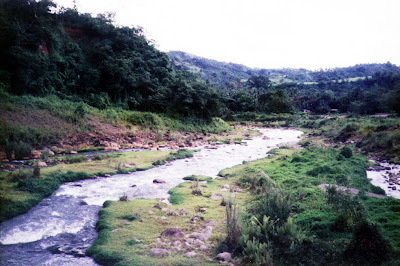 Diit, and one near San Juanico Bridge. In addition, two government vessels; a dredger found in Fatima Village in Brgy. 75, owned by the Department of Public Works and Highways; and a ship owned by the Bureau of Fisheries and Aquatic Resources; were also beached. Five more ships were beached in Quinapondan and Guiuan (Eastern Samar) – the MV Eastern Samar (Lilygene Shipping Lines Inc in Guiuan, Eastern Samar, owned by Mr. Generoso Yu), the MV Lady of Fatima (owner unknown); and 2 tugboats (MT Maharlika-A and MT Maharlika-B) and a barge (Vicente Uno) of Vicente Lao Construction based in Davao City. The MV Gayle (Unilink Shipping Corp., owned by Alfred Yanglua of Cebu), a big part of which was already floating on the water (making it easier to pull away from the shore), was removed from the shore last April in a salvage operation that lasted for 30 minutes. 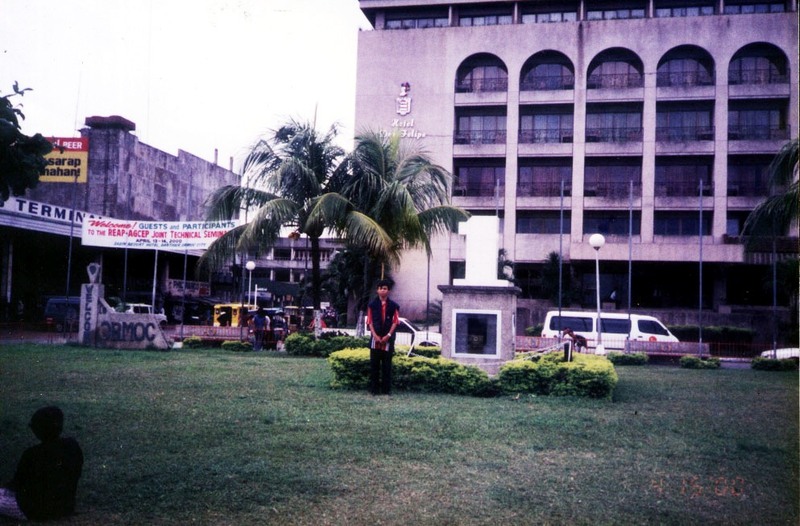 Afterwards, it was brought to Cebu City to be fixed (its propeller was destroyed and its engine needed to be replaced). Nine other ships have yet to be removed – the MV Eva Jocelyn (Eva Shipping Lines of Mandaue City, Cebu); the MV RKK 1 (RKK Shipping Lines, Inc.); the MV Star Hilongos (Roble Shipping Corp., owned by Joey Roble of Cebu); MV David Legaspi (Candano Shipping Corp., owned by Elena Candano of Tabaco City, Albay); the MV Jaguar (Tacloban Oil Mill of Tolosa, Leyte); the MV Ligaya V (Avega Brothers Integrated Shipping Corp. in Makati City); the MV Lancer (Matsya Shipping of Cebu City); the MV Tomi Elegance (Tacloban Oil Mill ); and LCT Rosman (owned by businessman Richmond Ng of Quezon City, Metro Manila). At Brgy. 68 (where the typhoon claimed 20 lives), we visited the 3,000-ton, red and blue MV Eva Jocelyn. When the supertyphoon smashed through Tacloban, a dozen cinderblock houses were directly hit by the ship and 4 residents were later found dead, pinned by the ship. Now sitting on unstable ground composed of debris, this ship is tilting due to the movement of the deteriorating ground. This could crush surrounding makeshift houses that were repaired by their owners. A bizarre sight was tourists having their picture taken right in front of this ship’s massive hull that flattened homes and killed people. However, these beached ships are temporary “tourist attractions” as the Philippine Coast Guard (PCG) wants the ship owners to retract, refloat or make into scrap their vessels by the end of January or mid-February 2015, otherwise, the PCG would salvage the ships at the owner’s expense. The owners, however, appear hesitant to immediately remove the vessels because of unfinished documentation for insurance claims. The residents want them removed as they have been “imprisoned” by these cargo vessels. They are also a painful reminder to them and hinder the removal and cleaning of the debris as well as in restoring the devastated coastal areas. 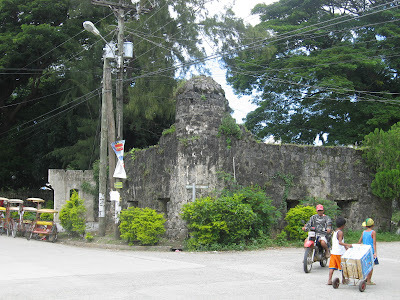 One of the most moving highlights of my return to Leyte, 8 months after super typhoon Yolanda (international name: Haiyan) hit the province, was our visit to the town of Palo, one of the most heavily hit places. Still vivid in my memory was TV footage of the town’s Cathedral of Our Lord’s Transfiguration (which underwent a US$35 million renovation a year ago) and its convent where GMA 7’s Unang Hirit reporter Ms. Lovella “Love” Anover, a native of Alang-Alang, and 500 other people sought shelter at the height of Yolanda. They all watched in horror as the full force of the winds slowly tore off the roof of the newly-renovated cathedral. The traumatized Love later broke down in tears while reporting live on camera. 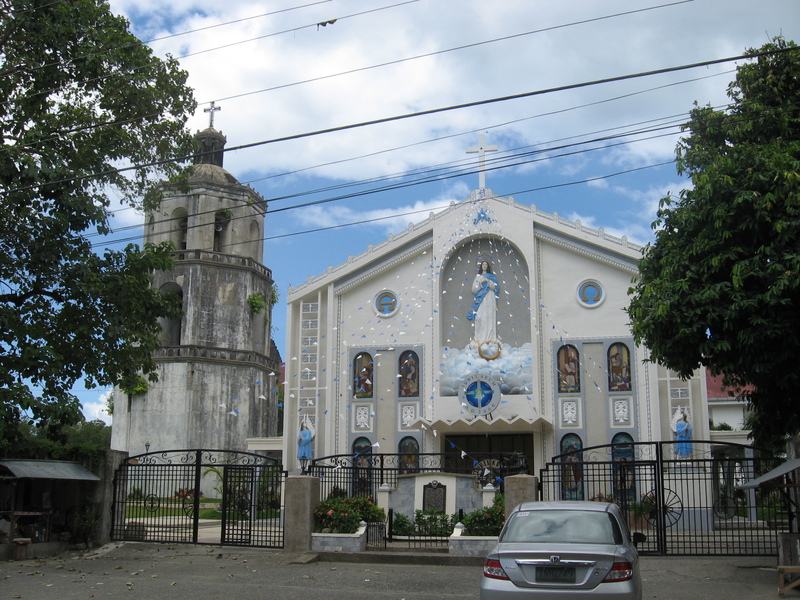 Of the 76 churches in the Palo Archdiocese, only six remained intact. Palo back then was celebrating its 75th anniversary (diamond jubilee) as an archdiocese. When we arrived there, a new roof had already been installed but much still has to be done as it still needs a ceiling, the main door was still unrepaired and the broken glass at its windows still have to be replaced. A new sight awaited us – a mass grave, fenced off by white ribbon and marked by flowers, for about 100 typhoon victims. This scene was repeated when we dropped by the church of Brgy. San Joaquin. At the church’s de facto plaza, once a grass yard where youth groups would practice hip-hop dances, a much larger mass grave could be found. Here, over 400 people were laid to rest. A statue of Jesus Christ of the Sacred Heart, with one arm outstretched and the other broken off, towers over the makeshift graves. Youngsters were playfully running around the graves. At the height of Yolanda, a tsunami-like storm surge reaching 18 ft. hit the barangay. Many drowned in the school beside the church. Luckily, no one was able to seek shelter within the church as the strong early morning winds prevented the opening the church doors to residents. They would have surely drowned. However, at least 25 children lost their lives at another evacuation center. Fr. Kelvin Apurillo, the parish priest, and his 11 sacristans who were trapped in the second floor of his house beside the church, all survived. However, some sacristans lost family members in the flood. Each marker, with rolls of names (numbering from 2 to 20 with others too long to fit) etched by felt-tip pens on boards fastened to sticks, tells a story. The surnames listed are often the same – spouses, children, in-laws, etc. Beside their names are their dates of birth, many born only past the year 2000 (the most vulnerable and helpless were the babies and young kids). Often, the date of death is not indicated anymore as everyone here knows when all these people died – November 8, 2013. 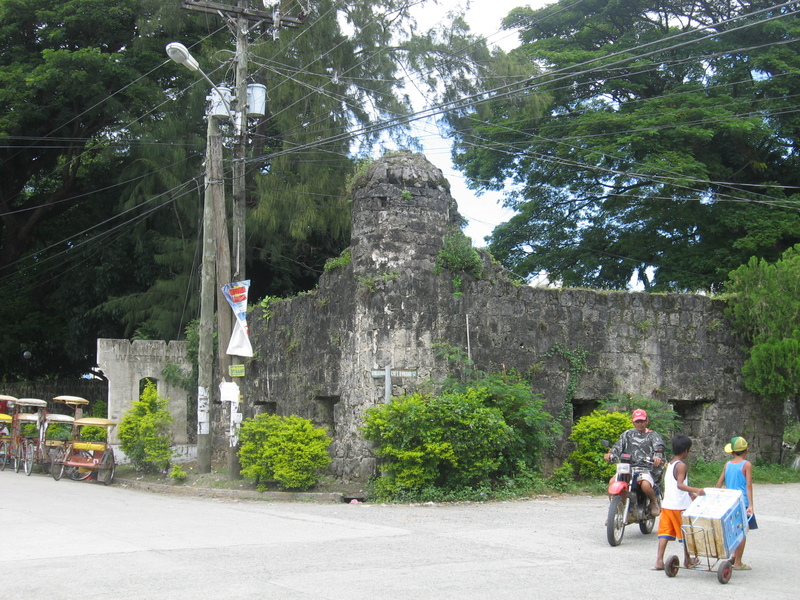 The mounds of this sudden, eerie cemetery along the highway, some shallow (the holes dug were only thigh-deep) graves containing almost entire clans (in one, 22 died out of 25 members of the Lacandazo family), are marked with tarpaulins or simple plaques and crosses and littered with candles (some lit), keepsakes of the departed (stuffed animals, toys, watches, bracelets, portraits, etc.) and offerings to the missed (plastic or real flowers, rosaries, etc.). Fittingly, I said a short silent prayer over this final resting place of lives cut short by the same fate. Each one was special. They had names, families, friends and dreams. May the loved ones they left behind continue on living amidst the ruins of their former lives. Jandy and I arrived at typhoon-ravaged Tacloban, via a Cebu Pacific flight, on the morning of June 29. Grace, Cheska, Marve and Kyle were already in the city, having left the day before. We arrived at my brother-in-law Manny’s house just in time for lunch. 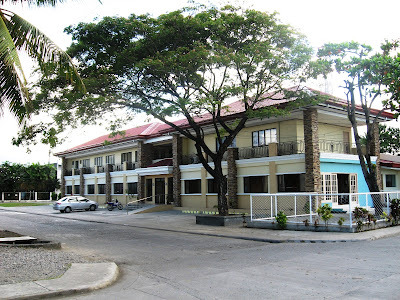 His house was conveniently located along Avenida Veteranos, one of the major city streets that the Sangyaw Pasasalamat Festival (which honors Señor Santo Niño de Leyte, Tacloban City’s patron saint) parade would pass through (Real to Imelda then Rizal towards Romualdez and will end at the Kanhuraw Hill). 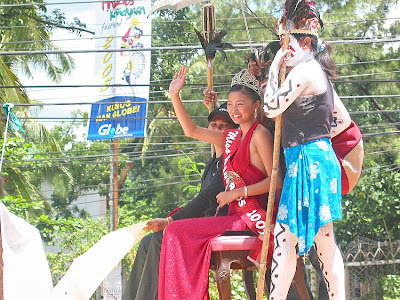 The parade, held nearly 8 months after Typhoon Yolanda (international name: Haiyan) devastated the city and other parts of the Visayas, was a simple affair, tame and devoid of much extravagance and glamour as with previous festival parades. The parade was participated in by more than a thousand merrymakers from 8 schools, 5 barangays, private companies (LBC, Talk and Text, Monterey, ABS-CBN, etc. ), government agencies (PhilHealth, Department of Health, Department of Education, etc. ), delegates from the various branches of the country’s armed services, and the humanitarian international non-government organizations (iNGOs) such as Oxfam, Save the Children, Volunteers for the Visayans, World Vision, Plan Philippines, Care Philippines, and the United Nations High Commissioner for Refugees (UNHCR), etc.. Eleven non-competing and six competing groups will join in the merrymaking. There were only 5 participating floats. With its theme “Pasasalamat,” the parade now focuses on thanksgiving for those who survived the wrath of the super typhoon as well as for Taclobanons and Leyteños to express their gratitude to the different iNGOs whose heartwarming assistance and support helped Tacloban and the Taclobanons get back on their feet. The iNGOs also made this parade possible by taking care of the logistics, giving a subsidy of not less than PhP30,000 to each participating barangay and contingent. During, the parade, thanks was expressed in the languages of the iNGOs – Australia (Thoinks Moite), Belgium (Dank U), China (Xie Xie), France (Merci), Germany (Dankeschön), Greece (Efharisto), Hungary (Koszonom), India (Nandri), Indonesia (Terima Kasih), Italy (Grazie), Japan (Arigato), Korea (Kamsahamnida), New Zealand (Kiaora Koe), Russia (Blagodarya), Spain (Gracias), U.S.A. (Thank You), etc. Though it was a gloomy Sunday, with scattered rain showers (but no excruciating heat from the sun), it was nice to see the people enjoying again and the city colorful, with many Taclobanons, in colorful costumes, joining the parade, exhibiting their unique innovations and creativity. The parade somehow relieved the stress and trauma that the Taclobanons have experienced after Typhoon Yolanda. At the same time, it also helped people in the area to feel that life is returning back to normal in the city. 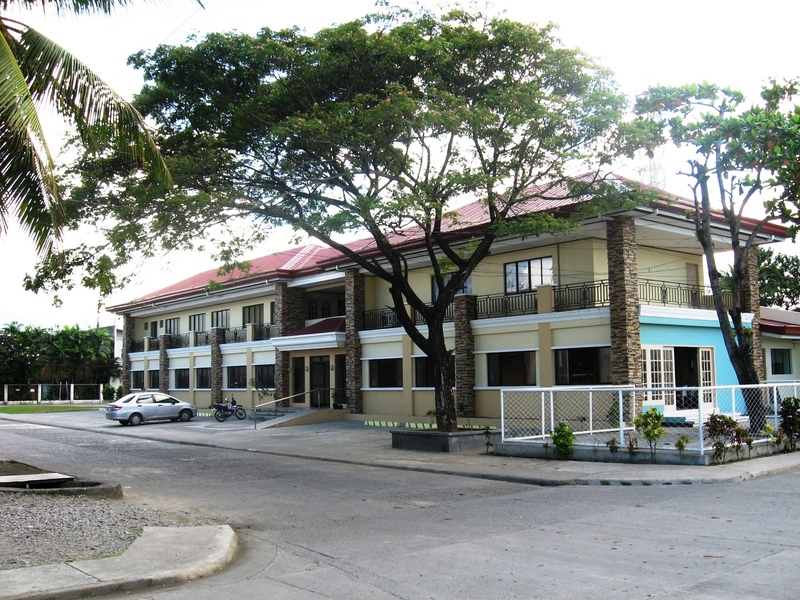 City Tourism Operations Office: City Hall, Kanhuraw Hiil, Tacloban City, Leyte. Tel: (053) 325-8955, (053) 325-2491, (053) 523-9671 & (053) 325-6248. I was supposed to attend both the simultaneous Pintados Kasadyaan and the Sangyaw (derived from the Waray word meaning “to herald the news”) Festivals in Tacloban City (Leyte), both held on the month of June, but missed out on the former as my son Jandy still had classes on the day of the parade (June 27). 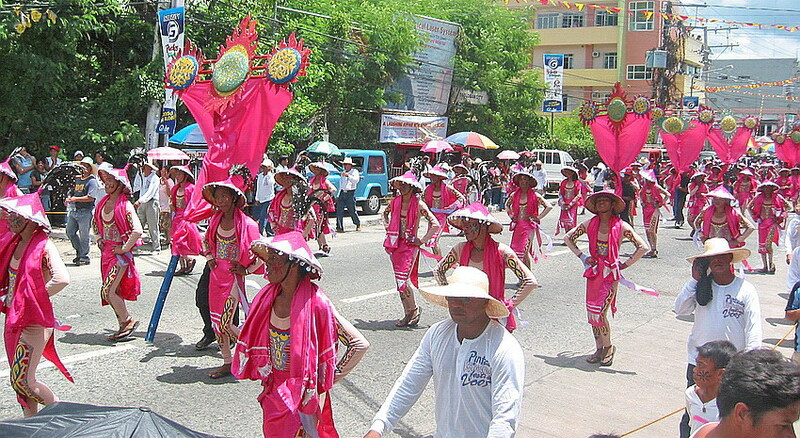 The Sangyaw Festival’s parade, held on June 29, the day after our arrival, was still worth the visit. This cultural festival was first created by former First Lady Imelda Marcos in 1974 but was discontinued after 1986. After an absence of more than 2 decades, it was revived last year by Tacloban City Mayor Alfred S. Romualdez, Imelda’s nephew. This year’s parade promised to be extra special as it was the 120th celebration of the Fiesta of Sto. Niño de Tacloban, the city’s patron saint, plus Tacloban also just became the first city in the Eastern Visayas Region to be classified as a highly urbanized city. As with previous parades, our grand view deck for watching the 3-hr., 3-km. long afternoon parade was Avenida Veteranos, packed, since early morning, with thousands of onlookers lining up to watch this unprecedented display of pomp and revelry. The festival’s street dancing competition was participated in by 17 contingents from different provinces and cities from Luzon (the Pattaradday Festival of Santiago City, Isabela; the Magayon Festival of Legazpi City, Albay; etc. 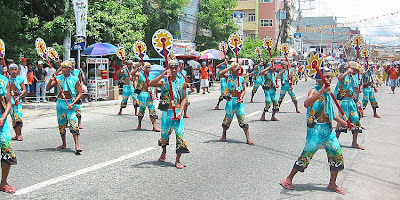 ), the Visayas (Sinulog Festival of Cebu City; the Dinagyang Festival of Iloilo City, the Masskara Festival of Bacolod City, Negros Occidental; Kawayan-Banigan Festival of Basey, Samar; etc.) and Mindanao (Bonok Bonok Marajaw Karajaw Festival of Surigao City, the Cocowayan Festival of Isabela de Basilan City, etc.). Tacloban City’s Tribu Kabatuk, last year’s grand prize winner, was on hand to defend their title. Cash prizes, for the Open or Free Interpretation Category, plus trophies were up for grabs. Like with previous cultural competitions, these street dances depicted Filipino culture and tradition. Each contingent performed, for 3 mins., in designated streets (Imelda St., Rizal St. and Justice Romualdez St.) before performing, for 5 mins., at the Balyu-an Amphitheater. The dance drama presentation showcased the ingenuity, talent and creativity of the over 1,000 participants as well as the cities, schools and institutions they represented. Makati City was ably represented by its Drum, Lyre and Bugle Corp contingent, dressed in their gay blue and white parade attire. The Bonok-Bonok Maradjaw Karadjaw Festival, represented by Surigao City’s West Central Elementary School, grabbed all four minor prizes (PhP50,000 each) in the open category (best in costume, best in musicality, best in street dancing and best in choreography) plus the PhP500,000 grand cash prize. Second place (Php300,000) went to the Kawayan-Banigan Festival and third place (PhP200,000) went to the Pataraday Festival. In the community and school-based category (with 10 participating contingents), best in costume (PhP10,000) went to the Alibangbang Festival of Dolina and best in musicality, street dancing and choreography (PhP10,000 each) to the Eastern Visayas State University (ESU). The eventual grand champion (winning PhP300,000) was EVSU. Second place (PhP150,000) went to Holy Infant College and third place (PhP100,000) to Sagkahan. Come nighttime, these same people who lined the streets for the parade also filled up Balyuan Barbecue Park and Amphitheater and the Tacloban City Convention Center, venues of concerts and other entertainment for the weeklong socio-cultural festivities. Business was brisk and hotels and inns were fully booked with tourists, both local and international, truly an indicator of the festival’s success and its worthiness of being returned to the tourist map. City Tourism Operations Office: City Hall, Kanhuraw Hill, Tacloban City, Leyte. Tel: (053) 325-8955, (053) 325-2491, (053) 523-9671 & (053) 325-6248. On my fifth day on Leyte, I decided to take a much needed break, my map updating work for United Tourist Promotions (makers of EZ Maps) just about done. My sister-in-law Paula suggested I bring along Selena and Sean, my niece and nephew respectively, and have lunch at Rafael’s Farm Garden Restaurant in the next town of Babatngon. We brought along their family driver Cherwine Avis. It was just a 13-km./30 min. drive to the restaurant. 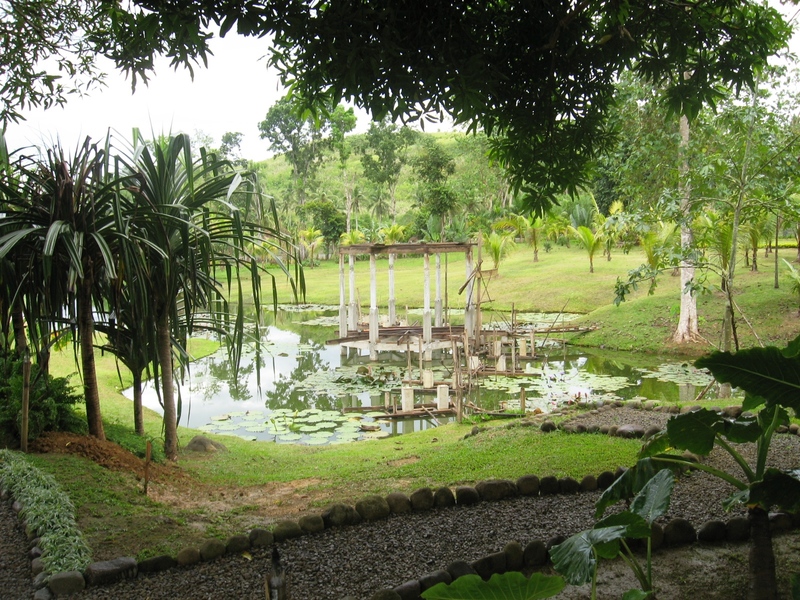 This peaceful, 16-hectare place in the middle of farmland, because of its ambiance, is a perfect place to dine, get close to nature and relax with its beautiful, well-maintained landscaping. There were many open green spaces to walk around, a wishing well, a manmade waterfall, a calesa, a treehouse for children to play in and a lagoon where one can go rowboating. A wooden platform leads to a gazebo at the middle of the lake. At night, fireflies swarm at a nearby tree. 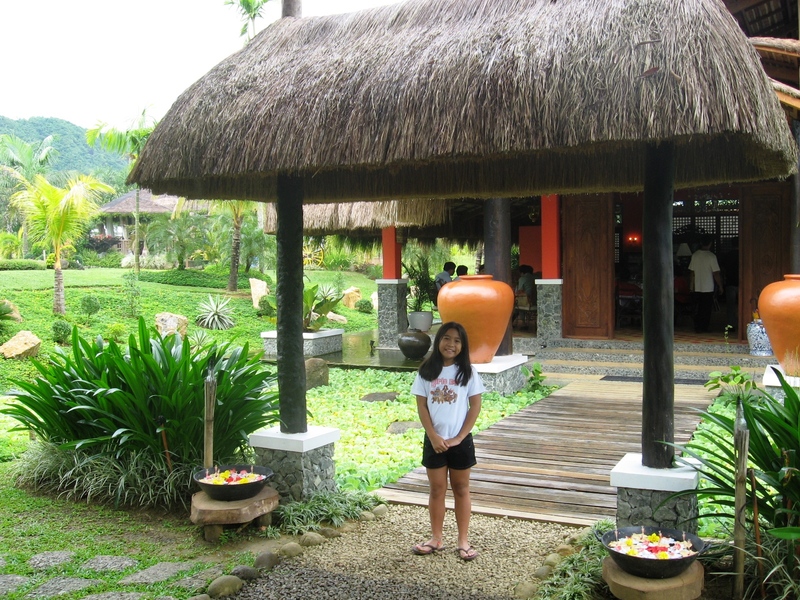 The restaurant was named after the grandson of owner/entrepreneur Rene Tampil. Rene is also the owner of meat shops and the “Join Us” fastfood eateries in Tacloban City. The thatched-roof main building, with its native decor and open on 2 sides, has a wooden floor, conversation areas with sofas, interesting coffee tables, old and lamps, sculpture pieces, and an infinity pond with koi fish around the perimeter. A favorite weekend destination, it is truly a nice place for one who wants to get out of noise and stress of city life, even if just for a few hours. The main dining area has dining tables topped with crocheted tablecloth and wooden chairs with woven abaca backrests and seats covered with banig. All around are artwork (done by local artists) for sale. The menu features a wide selection of delicious Filipino dishes (fish sinigang, grilled herb chicken, kinilaw, kare-kare, crispy chicken kawali, coco chicken stew, garlic butter fish steak, yellow pork chop, baked scallops, classic baby back ribs, etc. ), salads (farmer’s salad, garden fresh salad, etc. ), desserts (buko gelatin, halo-halo, turon, etc. 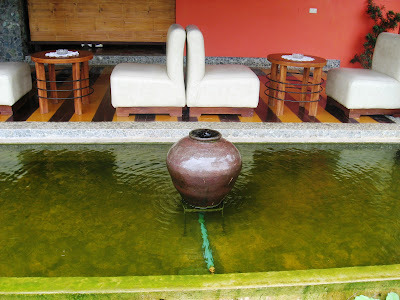 ), pastries and beverages (lemon grass tea, ginger tea, iced tea, etc. ), all at reasonable prices. You can avail of a set meal consisting of salad, a side dish, rice, main course and dessert for PhP220. Rafael’s Farm: Brgy. Pagsulhugon, Babatngon, Leyte. Tel: (053) 325-0729. Mobile numbers (0918) 669-9909 and (0915) 920-0325. 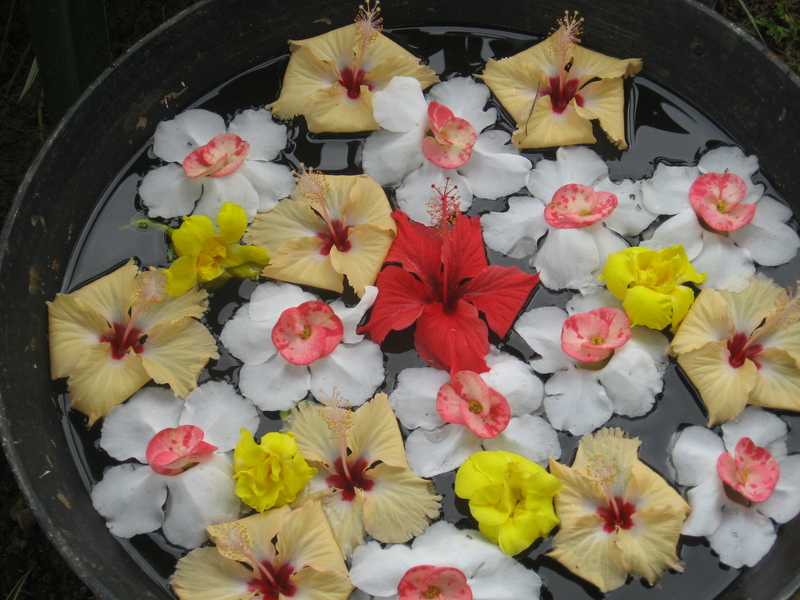 E-mail: inquiry@rafaelfarm.com and reservation@rafaelfarm.com. Website: www.rafaelfarm.com. Continuing on our way to Maasin City, Doods and I traveled the next 44 kms., past the towns of Inopacan and Hindang, to Hilongos. There, we made a brief stopover at the town’s Spanish-era, fortified Church of Our Lady of the Immaculate Conception. This church was built by Jesuit friars in the 18th century and renovated by secular Fr. Leonardo Celis-Diaz, a native of Cebu. The original church, now incorporated as a transept, was a single-nave structure whose main door was also the gate to a bastioned fortification. Some bastions and walls of that fortification still remain. The main nave of the church is a modern construction and the church interior is completely new. 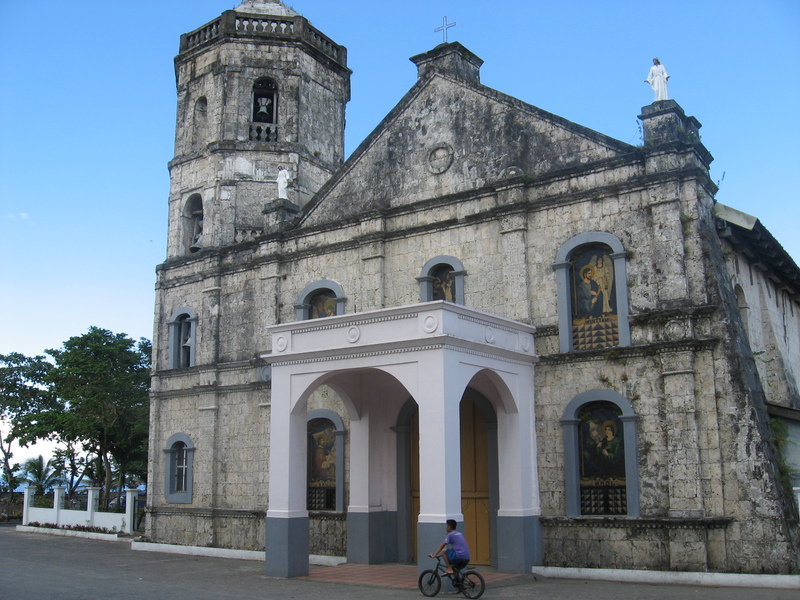 However, the town is more known for its octagonal flanking bell tower, now considered as the highest existing bell tower built in the Spanish era. Also built by Fr. Celis-Diaz, this independent multi-storey structure is now plastered over with Portland cement. The convent, probably completed in the 19th century, houses many of the church’s antiques including silver vessels from the 18th century. After breakfast at Bahia Coffee Shop, I was picked up at the Hotel Don Felipe lobby by Mr. Doods Alcaraz, a medical representative requested by my sister-in-law Paula to drive me to Maasin City where I was to do map updating for United Tourist Promotions (makers of EZ Maps). We used Dood’s car for this purpose. We left Ormoc City by 8:30 AM. The Maharlika Highway, though concreted, was pockmarked with cracks and potholes and first time drivers along this route would have to drive with caution. Doods, however, frequently plied this route and knew it like the palm of his hand. After 46 kms., past the town of Albuera, we made our first stopover for merienda at a Jollibee outlet at the new component city of Baybay (it became such by virtue of Republic Act No. 9389 and was ratified by a plebiscite held on June 16, 2007) on the central west coast of Leyte where ferries leave for Cebu and the other islands. 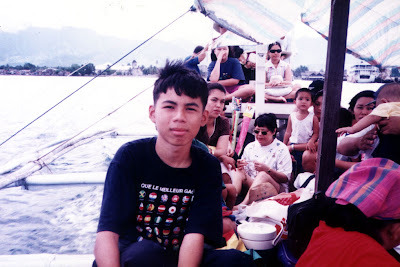 This wasn’t my first visit to the city as its port was our jump-off point for our April 22, 2000 visit to the Cuatro Islas (under the jurisdiction of Inopacan). On November 18, 2008, the Supreme Court struck down Baybay’s cityhood law, making Baybay a municipality again. On December 22, 2009, acting on the appeal of the so-called “League of 16 Cities” (of which Baybay is a part of), the Supreme Court reversed its earlier ruling but, on August 24, 2010, again reinstated its 2008 decision. On February 15, 2011, the Supreme Court upheld, for the third time, the cityhood of Baybay. Baybay is a city again. After merienda, I dropped by the town’s Spanish-era Church of Our Lady of the Immaculate Conception. The church was built in 1852 by Fr. Vicente E. Coronado and continued under the supervision of Maestro Proceso from Manila. In 1866, fire destroyed the church except for the Chapel of the Holy Cross. It was repaired in 1870 and finished by painter and sculptor capitán Mateo Espinoso (probably a local dignitary and artisan). While Charlie was still recuperating from a bout of flu (and avoid catching it) at Sabin Resort in Ormoc City, I left, via van, for the 2-hr. trip for Tacloban City. My timing was perfect as the city was holding its Pintados-Kasadyaan Festival, the biggest and most colorful festival in the Eastern Visayas Region. Heldon June 29, it features street pageantry of ethnic dancing to the rhythm of bamboo sticks and a contest focusing on the Leyteños’ old custom of tattooing that signifies courage and status in the community which earned for the Leyteños the name of pintados. Instigated by former Leyte Gov. Remedios Loreto-Petilla, this cultural-religious festival was first held on May 12, 1996 and it was only in 1999 that it was fixed to June 29, the Feast of the Señor Sto. Niño de Leyte. It showcases the rich cultural heritage of the Leytenos and Samarenos, incorporating indigenous music and dances.The Kasadya-an (Visayan word meaning “merriment and gaiety“) Festival, on the other hand, showcases the unique culture and colorful history of the province of Leyte. I was staying at my brother-in-law Manny’s house along Avenida Veteranos which happened to be along the route where the grand street dancing parade would pass, thus giving me a ringside view of the various congregations showcasing the various municipal festivals of Leyte and the neighboring Samar and Biliran provinces via a colorful and vibrant dance-drama parade. The Alikaraw Festival contingent of Hilongos was adjudged as the street dance champion. Other floats, including one carrying Ms. Leslie B. Montano (Miss Pintados 2005), joined the parade. She was crowned just the night before at the city’s Human Resources and Development Center (HRDC). On our last whole day stay in Leyte, Jandy and I were invited by Mr. Roy Perez, a medical representative of Astra Zeneca who toured us around Ormoc City, to join him and his family and relatives on a picnic tour of the Cuatro Islas. We were picked up by Roy after breakfast and, in his car, we traveled the 107-km. distance to Baybay in about 2 hrs.. At the town’s port, we boarded, together with the others, a large outrigger boat rented for our use. 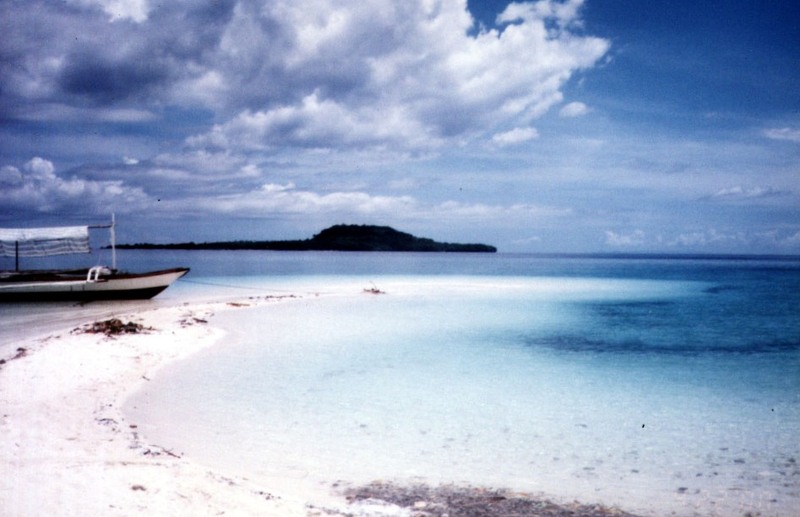 As the name implies, the Cuatro Islas consists of 4 lovely islands; Apid, Digyo, Himokilan and Mahaba, all of which are bordered by white sand beaches, rich fishing ground and unexplored coral reefs (a total of 287 species). 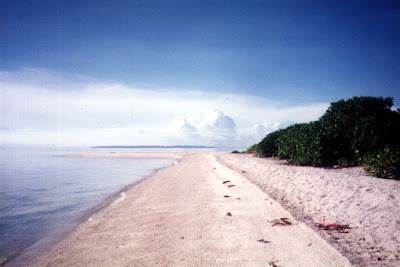 Though Baybay was our jump-off point, three of the four islands (Apid, Digyo and Mahaba) belong to the town of Inopacan while Himokilan Island is under the jurisdiction of Hindang. Digyo (pronounced as Dijo) Island, our destination, is the smallest, prettiest and most popular tourist destination of the four. After 30 mins., our outrigger boat made landfall at the island’s beautiful sandbar of fine, white sand. Good coral growth, ideal for snorkeling, are located at the western part of the island, facing Apid Island. The island is also a nesting site of sea turtles. While there, I circled the island in about 20 mins. Big, delicious coconut-cracking crabs called tatus are found in Himokilan Island, the largest of the four islands. Mahaba Island, serviced by outrigger boats, has a viewing deck, kiosks, sari-saristores and restrooms. Diving and snorkeling equipment, as well as barutos(stiletto-shaped dugout canoes) and glass-bottom boats, can be rented here. From Lake Danao, we again boarded our AUV and proceeded to Tongonan Hot Spring National Park. Located at an elevation of 2,000 ft. amid densely forested hills, this 272-hectare park is at the west end of the Leyte Mountain Trail, 18 kms. (a 45-min. drive) northeast of Ormoc City. It also has a cool climate, lush tropical vegetation and underbrush, a warm medicinal pool, a cavernous hillside geyser that spouts boiling water and steam hourly and formations exuding sulfuric vapors. It is also home to wild pig, monkeys, deer and birds. Its 112.5 MW Tongonan Geothermal Power Plant is the first geothermal power plant to operate in the Philippines. It supplies the region’s less than 100 MW consumption as well as that of the Luzon and Visayas grid. A little farther off is the 5-hectare Lake Kasudsuran, located in a virgin forest at Brgy. Ga-as and Mt. Hanagdan, 1,000 ft. above sea level. After the Tongonan tour, we returned to Ormoc City for lunch, switched to Roy’s car and next paid a visit to the house of our host, Mr. Sabin Larrazabal. We were greeted by his widowed daughter-in-law, Daya and his son Dr. Mario “Butch” Larrazabal who served us coffee and snacks. Mr. Larrazabal arrived after a few minutes. Already in his 70s, his still very active lifestyle belies his actual age. Roy introduced us, but due to Mr. Larrazabal’s hectic schedule, could only talk to us for a short while. After saying farewell, we proceeded back to the resort to check out our luggage. Before we were brought to the bus terminal, Roy showed us around the city. We also visited the Philippine-Japan Peace Memorial on Carlota Hills (a marker overlooking Ormoc Bay put up by the relatives of Japanese war veterans from the Nagoya and Gifu Prefectures) and the nearby cross-shaped common burial vault of the unknown victims of the Ormoc tragedy. Near the port, we visited the marker showing plaques of the city’s achievements, the remnants of the old Spanish-era Fuente de la Reina bridge and the 7,000-person capacity Ormoc City Superdome (where the PBA provincial games are played). Ending our city tour, Roy dropped us off at the city’s bus terminal where we took a PhP100 per person Hi-Ace van for the 2-hr. trip back to Tacloban City.